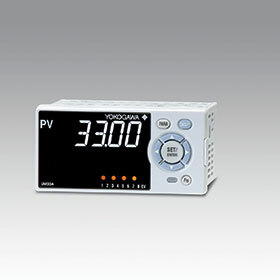 Yokogawa has added a network function to the UM33A digital indicator with alarms. With this network function, a single UM33A digital indicator can receive, process and sequentially display data from up to eight sensors. The enhanced UM33A is an easy-to-install and cost-effective solution that enables the monitoring of data from multiple field sensors. By improving the functions of its UTAdvanced product line, Yokogawa aims to satisfy the latest customer needs and expand its controller business. In recent years, there has been a growing need to improve the monitoring of data from field ­sensors. For safety and other reasons, operators need the ability to monitor data remotely from sensors that are installed high up, in confined spaces, and in other locations where it is difficult to visually check the readings on the sensor displays. The UM33A digital indicator that Yokogawa has been offering until now accepts analog data from sensors that measure parameters such as temperature, pressure and flow rate, converts this data into digital signals, and displays the readings. It can also issue an alarm if an input signal falls outside a preset range. However, it is only able to accept data from a single sensor. To check data from multiple sensors, it is necessary to install and configure other equipment, such as a touch-panel with an embedded controller or some other type of user interface used in combination with a programmable controller (PLC). This equipment is both expensive and requires a lot of engineering. • Easy to introduce/improved monitoring of data: The enhanced UM33A supports the master function and the data monitoring function of the Modbus/RTU communication protocol, and is able to connect with up to eight sensors and sequentially display data from those devices. The UM33A is thus able to monitor data from multiple field sensors without requiring the installation and engineering of a separate device with user interface and controller functionality. It can also function alongside already installed systems that employ such specially configured hardware. With its ability to remotely connect with multiple sensors throughout a site, the enhanced UM33A makes it easier for plant personnel to check measurement data from these devices. • An enhanced field digital solution: In plants, progress is being made in the introduction of field digital solutions that rely on digital communications between intelligent field devices and control systems. Field digital solutions allow the transmission of significantly greater amounts of data, including not only data on process parameters, but also instrument status information. The ability to monitor this information online improves maintenance efficiency. Thanks to its functional enhancements, the enhanced UM33A can handle both digital and analog communications with sensors, and is thus well positioned to facilitate the introduction of field digital solutions at plants. Sencom 4.0 additions enable flexible design and improve maintenance efficiency. The OpreX analyser family that enables the flexible design and operation of liquid analysis systems. New solution in the OpreX family improves maintenance efficiency and enables flexible design.